Welcome to Nan Belegorn, Valley of the Mighty Trees! 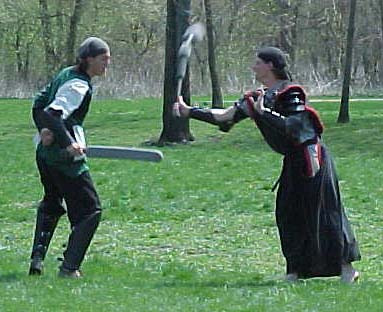 We are a realm of Belegarth Medieval Combat Society located in Cedar Falls, IA. Belegarth is a national organization that partakes in medieval and fantasy battlegames melded with role playing. We fight with padded weapon replicas known as foam boffers which enable safe full contact combat. To get a greater understanding of Belegarth, visit the national site at www.belegarth.com. We are also affiliated with the alliance of realms known as Eriador. From the Eriador site you can learn how to build weapons, find lots of game variants, and more. Visit the Eriador Web Board here. Nan Belegorn meets at the UNI Dome, which is located in Cedar Falls, IA. Get on Hudson St. heading north. You'll see the UNI Dome, it's the giant white dome. Take a left when you see it (onto the street between the parking lot and the WRC), then turn left into the rear parking lot. Enter through the back (west) doors and follow the tunnel onto the floor of the Dome. We're usually at the South end. If you're interested in participating with our group, or have questions, suggestions, or things to add concerning the website, contact Derian, our webmaster and secretary. If you want to keep in touch with Nan Belegorn, please visit our web board. Copyright © Josh "Derian" Mattson 2005. Banner Copyright © Matt "Kaiho" Menke 2003.